The 2016 Nationals are the first National League team in twenty-one years to have finalists in all four awards categories of the BBWAA Awards that include the NL Most Valuable Player with Daniel Murphy, the NL Cy Young Award with Max Scherzer, the NL Rookie of the Year with Trea Turner, and the NL Manager of the Year with Dusty Baker. The last team to have finalists in all four award categories was 10 years ago in the American League with the Minnesota Twins. Starting next Monday, November 14 through Thursday, November 17, BBWAA Awards Week on MLB Network will feature the exclusive live announcements of the winners of each award in the American League and National League by BBWAA secretary-treasurer Jack O’Connell. Hosted by MLB Network’s Greg Amsinger, BBWAA Awards Week will feature live interviews with award finalists, winners and BBWAA members, plus insight from MLB Network’s Sean Casey, Ron Darling, Brian Kenny, Dan O’Dowd, Dan Plesac, Harold Reynolds, Ken Rosenthal, Christopher Russo and Tom Verducci. MLB Network’s offseason programming will provide extensive coverage leading up to and following the daily award announcements, including on Hot Stove, High Heat with Christopher Russo, MLB Now, Intentional Talk and MLB Network’s signature studio show, MLB Tonight. 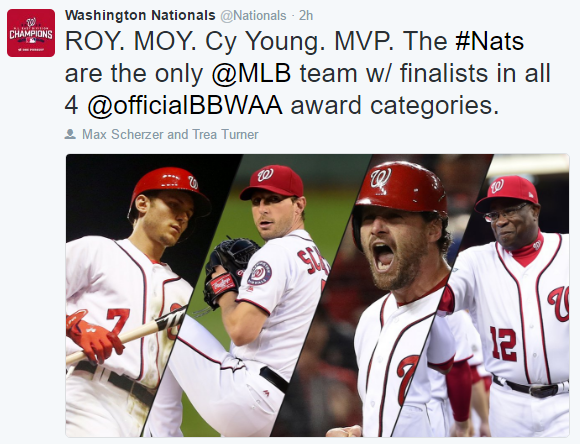 This entry was posted in Awards, Dusty, Murphy, Scherzer, Turner. Bookmark the permalink.